Vadim Gluzman believes the violin has a living soul – and from the pile of performance reviews on my desk as well as from my own ears, I believe he knows something about how to give it breath. This week he offers us a new recording, of the Samuel Barber Violin Concerto, Ernest Bloch's "Baal Shem," and Leonard Bernstein's "Serenade," all 20th century music, together offering a wide range of aesthetic and emotional content. Born in the Soviet Union in what is now Ukraine, Gluzman was a part of that powerhouse studio of Zakhar Bron that also helped produced violinists Maxim Vengerov and Vadim Repin. At age 16, Gluzman moved to Israel, where he met Isaac Stern, who became an influential friend and mentor. He went on to study in the United States with Arkady Fomin and at Juilliard with Dorothy DeLay and Masao Kawasaki. In 1994 he received the Henryk Szeryng Foundation Career Award. Gluzman, 36, also is the living steward of one of the more precious artifacts in our instrument's history: the Stradivarius once owned by the great Hungarian violinist and pedagogue Leopold Auer (1845-1930). Auer's editions of the major violin works – with his cadenzas – remain in regular use today. Then of course, is his teaching legacy. Auer taught Mischa Elman, Jascha Heifetz, Nathan Milstein, Efrem Zimbalist, Oscar Shumsky, and Shinichi Suzuki, among others. Gluzman has the instrument on extended loan through the Stradivari Society of Chicago. I asked him when he spoke with me over phone from Chicago last month, how does it feel to play on Auer's violin? Vadim Gluzman: It's been eleven years now, and still, sometimes I open my case and I take the fiddle in my hands and I say to myself, 'Wow.' I am amazed. The instrument is absolutely tremendous – of course, Mr. Auer must have known something about instruments. It's funny, he had two fiddles, both Strads. One from 1689 and one from 1690, the one I play. He must have liked that period, I don't know. This violin – it explains many things to me about pieces that were written for Auer. It has this unbelievable G string, it sounds like a del Gesu or a viola, dark dark dark, and huge. If you think about both Glazunov and Tchaikovsky concerti, they both start on the same note, A, in first position on G string. Both were written for this violin. The Glazunov (concerto) was premiered on this violin. I'm sure both Glazunov and Tchaikovsky had heard Auer play, and they knew the sound of the instrument, and they had this sound in mind. Laurie: How amazing, then, to play the Tchaikovsky and the Glazunov on that instrument! Vadim Gluzman: It's incredible. And then when I had the chutzpah to say that I'm going to record both on one CD... it was the most amazing material, to actually put it on record, on the original instrument. Laurie: Do you feel the instrument has changed you, and have you changed it, left your stamp on it? Vadim Gluzman: It's both, absolutely both. I do believe that the instrument is a living thing, and I do say this literally. I think there is a soul, and that there are feelings; it's like a relationship with a human being. We leave stamps on each other, as I'm sure you know. Laurie: I feel that way about my violin as well, even though I don't have a legendary violin. Vadim Gluzman: I don't think it has to do with how provenant the instrument is. An instrument is an instrument, it has its own character, its own life, and it relates to us just as much as we relate to it. It's not for nothing that in many languages, instruments are female or male, and not "it." Laurie: I feel like they leave an imprint of whatever has been played on them. 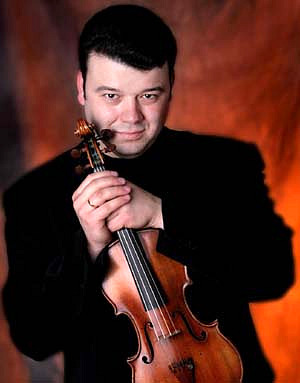 Vadim Gluzman: I remember that not that long ago I was at Bein and Fushi in Chicago and they showed me the General Kyd Strad, it's the Strad Itzhak Perlman played for a big part of his career, at the beginning. Ever since it has been with a collector, so it has not really been played on stage. When I tried to play it, and I heard a different sound, and it wasn't me. That was not me playing, it was his sound. So we do, of course, imprint our personalities into the violin. Whoever played this fiddle before me, since Auer – Kavakos, and Dylana Jensen as well -- all the people leave part of their soul behind. Vadim Gluzman: They examined them. It was a specialized school for musically gifted children in the Soviet Union. At the time, I lived in Riga, which is the capitol of Latvia. At the end of examinations they said that I sounded strong, I had passed my exams, and then they asked me to give my hands to the jury, which I did. I thought they were checking if my nails were clean, I was absolutely convinced. Then the next day, they put on the board the list of those that made it through. I was one of them, and next to my name, it said "Skripka" – Violin." I had a fit! In Russian, violin is a female, and piano is male. My father had told me piano was king of instruments and violin was a queen. What do you expect a six-year-old boy would want play, a queen? Of course not, he wants to play king! I keep reminding myself that the next time I go back to Riga, I have to ask these people, how do they judge 6-year-old hands? How do they see the progression, that it will be a good hand for violin? Because indeed my hands are good for violin, they are not good for piano at all. My first teacher still teaches there at that school, he's almost 80 now. Laurie: I understand you also studied with Zakhar Bron, were you in the same class with Maxim Vengerov and Vadim Repin? Vadim Gluzman: Yes, we were all in the same class. Laurie: It must have been an exciting time to be in his studio. Vadim Gluzman: It was incredibly exciting, to be there, looking back at it. Of course at the time I couldn't really appreciate it, I was a teenager, but what an atmosphere, to be growing up, all together. Basically it was an international competition every day. Not only were Maxim and Vadim there, but also there was Natalia Prischpenko – she is the first violinist of the Artemis String Quartet...It was really an incredibly nurturing environment, and (Bron) of course was a great inspiration. He managed to inspire us in very different ways – either through demonstrating or screaming at you -- and each of us received a really individualized treatment. Laurie: So how did he inspire you? Laurie: That can be very effective! Laurie: Do you like to teach, do you do it much? Vadim Gluzman: I love teaching, but with my schedule it's next to impossible. One place where I teach is very dear to me, Keshet Eilon in Israel. This is a violin master course, we do nothing but fiddle. There are really great people – this year we had Shmuel Ashkenasi, Schlomo Mintz, Ida Haendel – it's quite something. I was there as a student, the very first year of it, and then I've been teaching there for the last 10 years. This is really a part of my skin and blood, I can't imagine being with out Keshet Eilon. Laurie: How is it different than other kinds of summer programs? Vadim Gluzman: For one, it's only violin. And second, it's located in this gorgeous kibbutz in the north of Israel, in western Galilee – nature, to die for. I think what really stands out there -- and it's always been like this -- is that there is no feeling of competitiveness. Somehow the atmosphere is always so relaxed, so friendly, so nurturing. I see kids come back, from year to year. There also is a policy of open doors. Every teacher has his own studio, but then the kids are encouraged to go take lessons with everyone they can. (For example) this summer with Shmuel Ashkenasi we had a sort of team effort: I would send him Schubert, and he would send me Prokofieff. Laurie: I think it's a wonderful way to do it. Vadim Gluzman: You have to bring together a group of teachers who have their egos under control. But then you can see how the students blossom, it's amazing. Laurie: It sounds like you are very busy with the soloing. How do you handle that kind of life, with a wife (Angela Yoffe) and a daughter who is five? Laurie: Your daughter gets to see the world! Vadim Gluzman: Pretty soon we'll have to change her passport, because it's almost full. She's been traveling since she was three months old, she made her first cross-Atlantic when she was three months. Laurie: Is she interested in music? Vadim Gluzman: Unfortunately, she just began violin. Vadim Gluzman: I am! (laughing) I was hoping this could be avoided...I honestly did not have anything to do with it, I really tried to avoid it. But she insisted and insisted and insisted. She was making a hole in my head. I'm just as stubborn as she is, if she wasn't really insisting, I wouldn't give in. Laurie: Well if she enjoys it, that's good. Vadim Gluzman: For now, "Twinkle" sounds wonderful. Laurie: Is she doing Suzuki? Vadim Gluzman: Yes, there's a wonderful teacher here in Chicago Betty Haag. She is a very good friend and a dear person. Laurie: The Bernstein Serenade is one of the pieces on your new CD, and you also recently performed this same piece with the Chicago Symphony. Tell me your thoughts about it. Vadim Gluzman: I adore it. I really think it's not played often enough, I don't think it's considered to be important enough. Laurie: It's a strange thing, because it's a great piece. I have been in the orchestra, playing that piece, and I know that the fast movement is pretty tricky to put together. When I was listening to it on the CD, I realized that I knew that movement better than any of the rest of them because we played it so many times! If you were facing a conductor who didn't want to play the Bernstein, what would you say to convince him, or her that it's a good idea? Vadim Gluzman: It actually happens to me regularly, when I propose to play Bernstein, or for that matter, something that is not Bruch, Tchaikovsky or Mendelssohn. Some of the conductors say, 'Yes, yes of course,' but you look at the schedule for the season after next and it's still Bruch. But the Bernstein, it's truly one of the greatest violin concertos of the 20th century, and the reason it isn't played frequently here is mainly because it is difficult for everyone: for the conductor, for the orchestra, for the soloist, and even more, it is difficult to put together. But I don't think that's a good reason not to play it. Shostakovich No. 1, or No. 2 for that matter, is also not a lullaby. And yet we do play it, and we continue to think it is important enough to play. I think this is true of the Bernstein also. Vadim Gluzman: You are absolutely right, 100 percent. There is a distinct parallel there. Laurie: I wonder what it was, if Bernstein had heard it, or it was just the mood of the time. Vadim Gluzman: It might have been the wave of the time, but also there are parallels between the two composers, in a very weird way. Shostakovich's music has an incredible amount of pain, as we know. And we all know that ...the life that he led was really one shouldn't even wish on an enemy, not to mention a friend. Of course Bernstein lived in a completely different kind of society, and he had a completely different life. I never met him myself, but from everything I have read – and I have spoken with people who were his friends -- he was an incredibly tormented soul. If you listen to Age of Anxiety, if you listen to Jeremiah, you listen to the Mass, (you can hear the parallels.) He felt that he was not recognized enough as a serious composer, and I think that must have (shown) in his writing. Vadim Gluzman: He is all of that. But he is more. Laurie: The Serenade is a moody piece. It's not all sunshine. Vadim Gluzman: It's a very moving piece, it's incredibly powerful. And then in the fifth movement, he can't help himself, he embraces the party music, which I absolutely adore. After four movements of great contemplation and great variety of movement and colors, to let yourself go in the fifth movement, it's just incredible. But nevertheless, I think he wasn't appreciated. He was a great composer. Laurie: You also have recorded the Barber concerto on this disc. Vadim Gluzman: I think the coupling of Barber and Bernstein is natural. In my eyes, this is an American piece. I wanted to record Barber from the moment that I played it for the first time. I knew this was a piece ...I am in general very fortunate with my record company, I basically have carte blanche to record anything I want. Nowadays this is almost out of the question; I'm very grateful. Laurie: I wanted to ask you about the Baal Shem; I listened to the whole thing. Before, I was really only familiar with the Nigun, which is played frequently alone. It means something more with the entire work being played. Vadim Gluzman: Absolutely. Having said that, of course, Nigun is the strongest musical statement of this piece; it's not the most popular (movement) for nothing. But I think the whole cycle is absolutely extraordinary. We have to remember the name, he called it "Baal Shem Tov," and "Baal Shem Tov" was the founder of the Chassidic movement in Judaism. If we go a little bit deeper into this, the Chassidic movement basically brought the religion closer to the people, the simple people, so to speak, to those who were milking cows and making shoes. Not only to those who study – intellectuals. He realized that the populations were being neglected. He brought the importance of music into everyday Jewish life, and this is how the klezmer movement started. So this is very picturesque way of showing the Chassidic and the klezmer way of living. He dedicated the whole cycle to the memory of his mother. Of course it starts with the "Vidui," which is a confession prayer, really one of the most touching prayers in my religion. Then it comes to the "Nigun," which is of course, emotionally and thematically, the high point of the cycle. There is no good translation for the Hebrew word "Nigun." They say "Improvisation," but it really is not. Nigun is improvised, but really comes from the word "manginar." which is a melody, a motif. But it's not an improvisation, because "improvisation" gives us a little different understanding of the word, not in the way we understand it today. It's a word – it does exist in Russian, in a little different state; but not in English, not that I'm aware of. Then the third one, "Simchas Torah," it's a holiday, when Jews received the Bible, the Torah. It's one of very few happy holidays that we have, so of course the piece is very joyous and extremely exuberant, extroverted. I think it is a wonderful cycle, and it should be played as a cycle. I was very happy when the idea came, to record it all together. Laurie: I noticed that you have spoken out against using beta blockers. I'm not a big fan myself, but I thought perhaps you have some ideas for dealing with nerves. Vadim Gluzman: Go onstage as often as possible, there is absolutely no other way. And maybe one day realize – but sincerely realize – that all we do is produce sound, hopefully beautiful. We don't perform surgery, we do not build buildings, we do not produce anything. There is no harm in what we do, even if we do it badly. If you truly love you do, if music is something you can't live without, one will come to a point where accumulation of experience will compensate for nerves. I tell everyone who approaches me with this question: Find any possible opportunity to perform, and don't think about money, at least for the time being. Find yourself a retirement community, a church, a synogogue, any any any possibility. And just go out there and – I see no other way. To cope with nervousness medically, this is..I'm sorry. Laurie: What you say rings true, that performance is the key. You can see it, even with children. Just play for other people. It helps. Vadim Gluzman: You will be frightened in the beginning, it's natural. Even if you stand in front of 10 people, you are already nervous to speak. It's natural. But natural is good, I see nothing wrong. Frankly, nervousness, if one knows how to cope with it, will only add to your performance. It will not decrease anything, if you learn to deal with this. And you learn this from doing it. You can learn how to make it your friend. Keep your friends close, and keep your enemies closer! I realized on Thursday night that despite having listened to recordings of the Alban Berg Violin Concerto countless times, I hadn't come close to understanding it. Seeing a live performance enlightened me; moreover, seeing a live performance with violinist Gil Shaham, conductor Gustavo Dudamel and the Los Angeles Philharmonic at Disney Hall energized my senses. The evening also included two symphonies by Mozart, the “Prague," K.504, and the “Jupiter," K.551. Is the Berg Violin Concerto something I play over loudspeakers while relaxing after a long day? No. Berg's last piece was written as a memorial to a girl who died too young: Manon Gropius, the 18-year-old daughter of Alma Mahler and her second husband, Walter Gropius. The composer himself died shortly after completing the work, and the violin concerto's premiere performance in 1936 was as much a memorial to Berg as it was “to the memory of an angel," the young girl. This is not to mention that Hitler was exercising his full powers over Europe at the time. Not happy stuff. Not a happy time. The work also is based on a tone row – the basic concept of which I normally find to be corrupt, based on simple math but in no way based on the physics of sound or on the aesthetics of music. However, Berg was rather careful in the creation of his row, giving it some potential for tonality, and he also threw in fragments from an Austrian folk song and a Bach chorale to mix things up. Even most twelve-tone haters grudgingly admit that this work will likely stand the test of time. The opening of the piece reveals the composer's dual instinct: to stay true to the nature of the violin while experimenting with this then-new style. The soloist begins by tracing the open strings and goes on a kind of spooky exploration from there, as the orchestra awakens, stretches. To me the folk song fragments sounded more like a deranged, disjointed waltz, returning in various ways throughout the piece. Shaham's playing was ever smooth, never a crunch in the bow. When the melody fragment appeared in fingered harmonics, it poked through with clarity. As the second movement “Allegretto" progressed, it sounded to me like an old, mad mind, where bits of lucidity emerge from the murk. Then came the “Allegro": boom boom boom “Scrreeeeeeeee..." Violent and frenzied, like my mind would be after 20 cups of Peet's cappuccino – though that's something I'd never do unless I were suicidal. Are you loving this yet? But this is where the performance started getting interesting, with Shaham, who by now was definitely in a zone, channeling the full energy of this piece. I enjoyed the cadenza-like spot with left-hand pizzicato over a legato line. Shaham's hand crept up the fingerboard like a plucky little spider – a graceful one. It was clear that he'd long overcome the technical demands of this piece and was simply living it. In fact, he looked a little possessed, crouching over, bobbing his head as he walked forward, looking something like a beetle on its hind legs. I loved it, it completely fit the moment. Undoubtedly those who are distracted by movement might complain: Shaham walked all over the stage during the performance of this piece. When the music was unbalanced, Gil was rocking back on his heels dangerously – unbalanced as well. When it came to stasis as the clarinets played a church-organ-like passage, he became straight and still. The music never suffered for the movement. As Dudamel has said, music is energy, and Shaham's motions came from that energy. As the music turned back to that exploratory mode from the beginning of the piece, Shaham turned to the concertmaster, who joined in playing the same part as the soloist. Soon more first violins joined, then all. The second violins joined, little by little. Soon all of the strings in the orchestra were playing in unison, leading to a giant climax of unanimity and sound. Whatever it represented – a surrender to death perhaps – I found what followed to be the more poignant gesture: The strings drop from the solo line as they joined, abandoning the soloist to his own lonely line. The solo violin eventually ascends to the stratosphere where it hovers, as though disembodied, over the rest until it all dies away. Does anyone ever forget the first tune he or she learned to play? Mine is seared in my head and hands, and I continue to teach it to beginners, before Twinkle, unorthodox as it is in its pedagogy (double stops, all down-bow, Shinichi Suzuki would shudder!). My teacher called in the "Irish Jig," but I think it's not a Jig, and it might not even be Irish. It's all open strings and is a duet. Here are some of the "first songs" listed by V.com members who entered the contest to win Mark O'Connor's new method books. (By the way, the contest is still going, if you want to enter!) "Twinkle" is certainly in the lead! The tune that Mark O'Connor has first in his book is "Boil 'em Cabbage Down," and it looks like at least one person learned that song first, other than Mark! "The Snowman" from the Sam Applebaum series, aka "French Folk Song"
Tunes from "Tune a Day"
The theme from the movie "Superman"
If you can't go forward, go sideways for a while. This wisdom came from one of my teaching mentors, Jim Maurer, who recognized that not all students can progress straight through the Suzuki method, or any course of study, without reaching the occasional plateau. When a student has been stuck on the same piece, week after week, don't keep beating it into the ground. Move on. If you aren't ready to move up, find something different, but at the same level. Learn the same thing, a new way. Teach the same thing, a new way. These are my thoughts as the much-awaited Mark O'Connor Violin Method is released today, exclusively through Shar Music. Mark just might help us find a new way to teach violin playing, but one that moves alongside traditional and Suzuki methods. No need to throw anything away, but here is a way to move sideways, to broaden our base as we move forward. 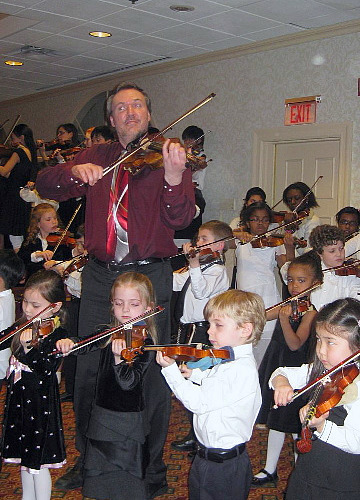 Mark's stated goal is to create an “American School of Violin Playing," using all American music to teach violin technique. Some of the titles in Mark's first two books include: Boil 'em Cabbage Down, Oh Susanna, Amazing Grace, When the Saints Go Marching In, Old Joe Clark, Sweet Betsy from Pike, Red Wing, Cielito Lindo, and Shenandoah. In addition, Mark wrote many of the pieces included in the books, including his Appalachia Waltz (an arrangement of the piece he recorded with Yo-Yo Ma and Edgar Meyer), Beautiful Skies, In the Summertime and more. In the unlikely event that you have never heard of Mark O'Connor, he spent his childhood winning fiddle contests and studying with American fiddler Benny Thomasson as well as with French jazz violinist Stephane Grappelli, has collaborated with famous musicians of many different genres and trains people young and old to learn new genres of violin playing every year at his fiddle camps. Lately he also has spent much time performing and recording in classical spheres, having released recordings earlier this year of his American Symphony and String Quartets, Op. 2 and 3. I talked with Mark over the phone on Friday about his O'Connor Violin Method, and he emphasized that there is an entire history of the violin – an American history – that is yet to be told. “Not just classical musicians, but even folk musicians don't know most of this (history)," Mark said. “People from all over the world cross-pollinated their cultures to create these amazing American music styles. Through hundreds of years of musical experimentation, we have some of the most important musical contributions the world has ever seen. That story needs to be told. Also, people need to be reminded that the violin itself took a lead role in that for 350 years, up until, arguably, when rock 'n' roll came into play in the 1950s. The violin was there at every single turn of every cultural movement, of every musical style: ragtime, blues, bluegrass, swing, jazz, and Cajun, Tin Pan Alley, vaudeville. That's something that this method will expose. The histories are riveting all the way through it." Indeed, there is a lot more than sheet music in these books. First, they come with a CD of Mark playing all the tunes. They also include a history for each piece, colored photos and illustrations, alternate ways of playing the tunes, lyrics, theory and technique, and a cute little Mark avatar named “Fiddle Boy" who has a kid-like comment for each piece. So far, Mark has written two method books for violin, with piano accompaniment, and he plans to write a total of 10 books. He said that over the coming months he will work on versions of the first two books for viola, cello and bass, as well as orchestral arrangements meant for group or school settings. “It is an oversimplification to say that this is 'just like the Suzuki method but with American music as its content,' but that is a pretty fair and concise description," said Charleston, S.C.-based violin teacher Pamela Wiley, who has been teaching the Suzuki method for more than 40 years. She was a consultant on the O'Connor method books, as was strings educator in Lexington, Boston, Washington D.C., Miami, Los Angeles, Chicago, Albany, Cleveland and Toledo. “Mark did not set out to copy or compete with the Suzuki method," Wiley said. “Both men have the same goal - the happiness of children and the love of the violin - so there are natural comparisons. There is certainly nothing anti-Suzuki or un-Suzuki about the method. I, personally, see Mark's method as a natural evolution of the Suzuki method for our emerging musical culture in America." Suzuki had his Twinkle Variations that every beginner learns; Mark has “Boil 'em Cabbage Down" – an old African-American song that was the first tune Mark himself learned to play on the violin. The first book begins with the variations, then sprinkled throughout the books are more challenging variations that introduce new techniques. “I patterned my method after some of the great methods out there, especially Suzuki, because they introduced very young people to a sequence of tunes. That's something that is also inherent in folk music learning, too," Mark said. The aural tradition – learning by ear – is another element shared between Suzuki and folk music. 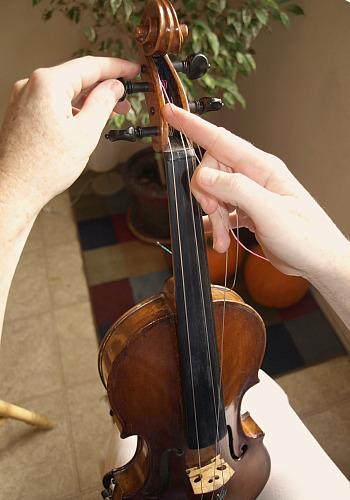 Ultimately, violin technique is the same, whether you are playing fiddle music, classical music, jazz or any style. The challenge was in creating a sequence of tunes that both teaches the proper techniques and holds together artistically – this is why the project had such a long gestation period – about 14 years, with pen going to paper over the last four of that. “I was very careful in selecting the music for this method. I didn't pick something because it was a nice old tune," Mark said. “It had to bring something to the table, technically, so the student could acquire a specific skill." As with “Boil 'em Cabbage Down," Mark used a lot of the tunes he first learned as a student. “There are some of the old tunes that are not as instructive and not as pedagogical. But I was very lucky in that I had teachers who taught me tunes that helped me learn how to play the violin, as well as being timeless, cool tunes and great rhythms." “There are a lot of beginning materials that might work technically but aren't artistically as sound," Mark said, “and there are a lot of traditional materials that are great artistically, but they don't really break down the skill acquisition correctly. So you have to think on all those different levels." The sequence is progressive, with each new piece building on skills learned previously. The trick was to find the perfect piece to introduce each technique, and to get them in the right order. For example, the tune Mark chose for introducing the low second finger is “Old Joe Clark." “Here's the perfect melody for the low two," Mark said. A student who hears “Old Joe Clark" wouldn't dare misplace the second finger when playing the tune. “You listen to it and you just know, there can't be any other way that melody is going to sound, that's the way it is. It's so catchy." When the music itself makes those kinds of demands on the student, the teacher finds it much easier to teach the needed technique. “The literature itself reveals some of the mysteries, secrets, and – honestly – a lot of the hardships that teachers deal with, trying to get the message across." “Students want and need to learn traditions – history inspires young people," Mark said. “But they also want to be involved with something that's happening now." Mark's new pieces are a bridge between new and old, and he hopes that they also “show how these materials can develop into a new American classical music, to the point where this is no longer a fiddle method, or a folk music method or a traditional music method; it's designed to launch the player into any area of expertise that they ultimately want to go to. So if somebody wants to play Beethoven and Mendelssohn at some point, there's nothing in this method that will prevent them from doing that. Same way with jazz, same way with folk music." “There's a whole creative component," Mark said. A student can choose more than one way to play these tunes, and the book shows this by offering alternate versions of various passages, accompanied by lyrics. “The children will get to see that the material is flexible: you can stretch it, you can twist it. Here are the lyrics, here is a slightly different rendition. I have made sure the student will be able to play the version that the lyric is attached to. Right away they'll see there are options." My students were lucky enough to have been among the guinea pigs for Mark's new violin method over the last year, and quite honestly, they ate it up. And I'm evidently not the only teacher hungry for a new way to teach the timeless art of violin technique, for music that speaks to my American students. “I've been using (Mark's) method in my own studio - private lessons and groups - since March," said Wiley. “The kids just love the music. They want to play this repertoire and they will do what needs to be done (technique-wise, practicing) to do it. I have kept up with some of the Suzuki repertoire also, but the children are more naturally motivated by Mark's music - both his original compositions and his choices from the American music tradition. I have also received many reports from other teachers using the method of similar experiences. The music is infectious and highly motivating." “This sort of method gets people playing tunes that are also fun to play, but at the same time are very comprehensive in skill sets that they embody along the way," Mark said. And it is essential to get a student to play, and to play often. “There's only one way to learn the violin, and a teacher can't give that to you and a method book can't give it to you: It's called 'practice.' Unless the student is playing that violin, practicing and giving attention to the instrument, they're not going to be able to acquire this skill." 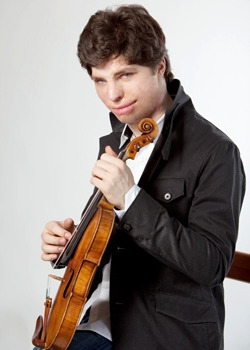 Much of the United States may have been buried in snow, but Los Angeles had one of its rare, crystalline perfect days for violinist Augustin Hadelich's recital Sunday at Clark Library at UCLA with pianist Ian Parker. 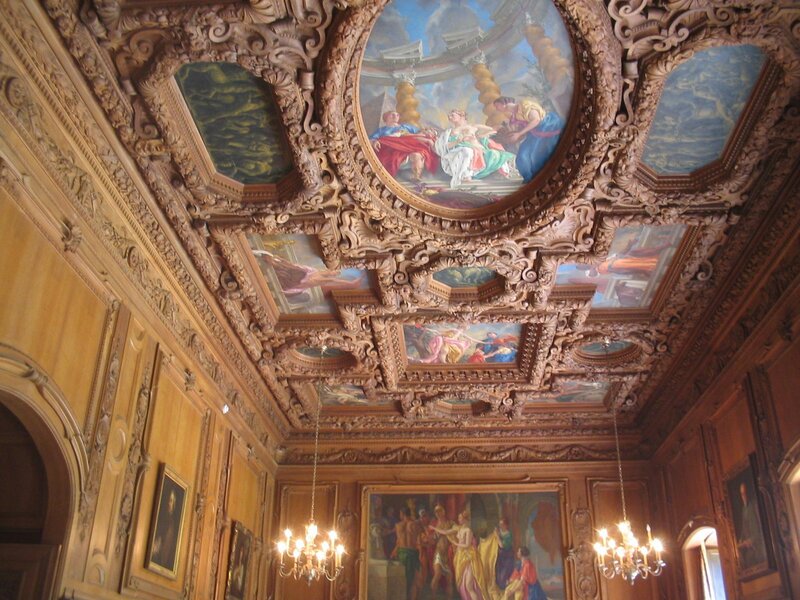 The recital was held in the library's ornate drawing room, its ceiling painted with scenes from Anthony and Cleopatra, each scene framed with intricately carved wood. Along the side walls stood a marble fireplace, portraits of the library's founders and a picture window letting in sunshine from an opulent green lawn. Something in this elaborate set-up seemed to match the meticulous work that goes into preparing a program of Beethoven, Takemitsu, Poulenc, Zimmermann and Prokofiev. And happily, the small venue was full; the Clark distributes tickets for its chamber music program by lottery, so nearly all of the 100 seats were filled. I hadn't heard violinist Augustin Hadelich play since 2007, just after he won the 2006 International Violin Competition of Indianapolis. Since then, he's kept busy, recording the complete Haydn violin concerti, as well as a more recent recording called Flying Solo, with all solo violin works. This year he won the Avery Fisher Career Grant, and he continues with a full schedule of recital and orchestra appearances. Hadelich and Parker started with Beethoven's Sonata for Violin and Piano no. 8 in G, op. 30 no. 3, the first movement an elegant wash of notes. Despite the technical and musical demands of the rest of the recital, I personally enjoyed the second movement of the Beethoven most. The movement features such a simple melody, like something from childhood. In spinning this melody, Hadelich reached a point where he held his audience still and spellbound – I didn't even want to tear away to move my pen. I confess, these days when I hear a violinist of high caliber, I'm less interested in how they handle this little turn or that harmonic (though I suppose if it were a heinous crime against propriety and genre I might flinch) than I am in whether this captivating quality exists. To reach out this much shows a generosity and selflessness, a willingness to communicate with the audience. Without thinking, I noted that Hadelich's fiddle has a wonderful warmth, a chocolate tone that is rich enough to be a treat but not so rich as to sound over-sweet. Then I realized, he is still playing the ex-Gingold Strad (1683), which he'd been granted for winning the Indianapolis competition. The last time I'd seen this instrument was when I was watching Gingold himself teach at Indiana University, nearly 20 years ago. Happily, that golden tone lives on; it seems a wonderful use of Gingold's instrument, to start a young artist on his or her way every four years, following the competition. Next was Takemitsu's "Hika," and as Parker explained, "It does not contain melodies you will likely want to hum or whistle on the way home." He was correct. The piece is based on a tone row; understandable more as gesture than as melody. It made me think of a walk through a minefield on, say, Halloween night. Nothing explodes, but the close calls are startling, in this cautious creep through the murk. It ends with a low-ish sustained note in the violin and "plink!" way up on the piano. Parker and Hadelich introduced the next piece, Poulenc's Sonata for Violin and Piano, Schmidt 119, as a piece that the composer felt was an "utter failure," though they disagree with the composer. "We both enjoy it!" Hadelich said. The beginning sounds hurried and lost, with some melodic moments of deliberate direction. The piano pounds – it may have been pounding a bit too loud, I think the lid could have been lowered somewhat in this venue. The second movement was the one Parker and Hadelich said they liked, for its harmony. As Hadelich said beforehand, "The French have this great talent for creating harmonies that evoke a feeling, all on their own." A chord sounds, and the mood shifts. Indeed, the soft but insistent chords in the piano were like a canvas on which the violin could add its line, but the canvas changed color throughout the movement. After intermission Hadelich played Bernd Zimmermann's Sonata for Solo Violin. If you like bariolage, left-hand pizzicato, huge leaps and millions of notes, you might try this sonata by this rather dark composer, who wrote the opera Die Soldaten and whose life ended in suicide in 1970. Hadelich, who recorded this piece on his most recent CD, negotiated the difficult piece with grace, whipping up the excitement at the ending, with frantic double stops becoming ever more frenzied until the one pizzicato that ends the piece. The recital ended with one of my favorite pieces, Prokofiev's Flute Sonata-made-Violin Sonata, No. 2 in D major, Op. 94a. With all the pieces composed for us on the violin, do we really need to steal from the flute repertoire? In this case, certainly so. The piece should be played on both instruments. The openings feels like it was made for the violin, featuring some of the instrument's most resonant notes. The violin/flute line starts with an A, falling back upon it several times as though it were a comfortable pillow, before arriving at a G and repeating the pattern. A few bars later we land satisfyingly on D before getting down to business. This introduction is enough for falling in love with the piece, but there's much more. Prokofiev was a composer who knew how to tell a good joke, and the second movement "Scherzo" scurries in confusion, with occasional glimpses of a dance, and other occasional glimpses of a triumphant march that can never quite get going. The third movement is a haunting, meandering line that turns into a dizzy, wandering line. The fourth movement goes back into triumphant mode, but one gets the sense that the victors are slightly full of vodka. It all ends with a lot of noise, and this is exactly how you want to end your program because it brings people to their feet. But they would have been on their feet anyway for Augustin. It was a pleasure to hear him play.